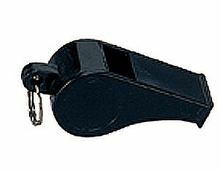 Mini black whistle made of plastic with metal ring to string on your own lanyard. Nice loud sound carries very well. Compact size and lightweight.